Disclaimer: The printed model may not be accurate, and some bug in this calculator might produce erroneous result values. Please report any errors, but keep in mind that you use this tool at your own risk. The RadGauge is attached to the end of your caliper. The depth probe is then used to measure the height difference between the two points and the probe. The RadGauge fits calipers roughly 16 mm wide x 5 mm thick. 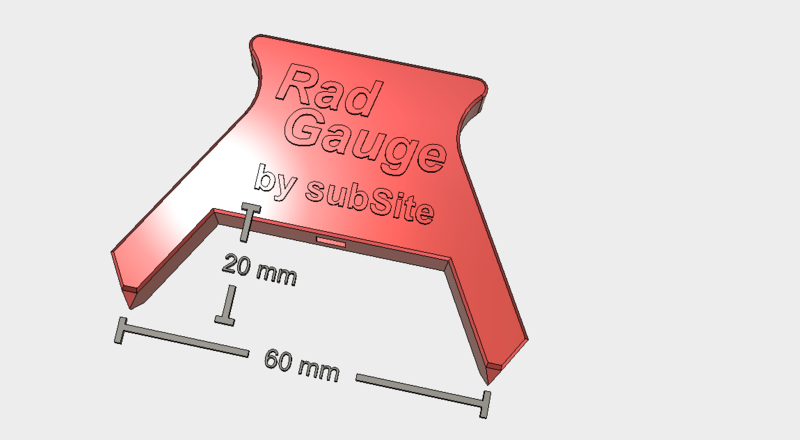 There are two versions of the RadGauge, one has a 60 mm gap, the other 30 mm. Select the one you are using. Measure the radius by putting the RadGauge firmly against the curved surface, and extend the depth probe until it touches. Make sure the caliper base touches the bottom of the slot. Enter the measured value (in millimeters) into the calulator. It doen't matter if it's an inner or outer curve, the calculator works either way. The 20 mm offset will probably not be exactly 20 mm when it comes out of your printer. When measuring large radii (some furniture, for example), a small error will make a big difference. The tip of depth probe will most likely never be exactly centered, so you will not get perfect accuracy with this tool. You can, however, do some fine tuning to get pretty good results. Method 1, custom offset: Check the error by measuring against a flat suface. Take this value (I get 19.52 from my first print) and enter it into the "Custom" height offset field. The calculations will now be compensated for this value. Method 2, zeroing a digital caliper: Measure againt a flat surface and press the Zero button. Set Offset to 0 when using the calculator. I like beer. If you'd like to buy me one, just open up my Thingiverse profile and hit Tip Designer! The RadGauge 3D model is licensed under the Creative Commons - Attribution - Non-Commercial - Share Alike license.